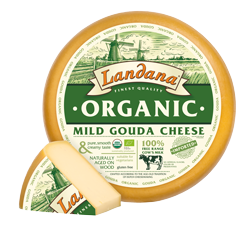 Landana ORGANIC is exclusively made from the pure, organic milk produced by cows and goats from Holland. The milk is natural and pure. 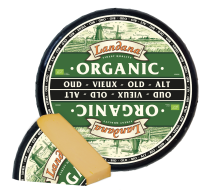 Landana ORGANIC Gouda is prepared according to the age-old tradition of the master cheesemaker and matured naturally. Landana ORGANIC contains no artificial colourants and flavours and no preservatives. This cheese is suitable for vegetarians, low in lactose due to its natural maturation (lactose <0.1 g/100 g) and is an ideal component of a gluten-free diet.